Thank you to St. Martin’s Press and NetGalley for this eARC! You can get a copy for yourself on September 18th! There are some times that you have great, high hopes for a book and then you are disappointed. For the most part. Let’s get those parts over first. It is undeniable that this is a fantastically written book. I mean, holy moly Jay Kristoff. It isn’t often that you find that level of prose in a YA book. Every sentence was written with complex visuals that left you able to image the scene or object being discussed right down to the smell. Kristoff remembers there is five senses to deal with. However, while I enjoyed this as I tried to understand his equally complex world, I found this to be a problem in action scenes. Often, a section of the book would be bogged down with flowery language that, while impressive, just isn’t what I like to read. I prefer my books to go FAST. It’s strange to explain but the point of this convoluted paragraph is: while I am amazed at the level of prose, it slowed down an otherwise fairly action heavy plot. While we’re discussing words, let’s talk terms. Japanese terms. Made up terms. Technical terms. There are a LOT of terms in this book. When you pick up a copy of this (which you will, and I’ll explain why in a minute), please remember that there is a glossary in the back. If you’re reading this as an eARC PDF, as I was, there is no easy way to skip between the glossary and the part you’re currently reading. In the first chapter, especially, my mind was BLOWN by all the terminology and I continued to struggle to wrap my head about it for a large portion of the book. Both those two things are what caused the book to be hard for me to settle into. I was, at the same time, skimming and rereading to try to understand all the terms, but to also have the book move forward in some way. The beginning of the book isn’t very fast (and I don’t like books that start with a chapter and then begin the second chapter with “X amount of time previous”). However, this betrays the rest of the book, especially the entire second half. The second half of the book MOVES. Despite (and sometimes because of) the way the book was written, I felt that the world building was very solid. I may not have understood every facet, but Kristoff has this down watertight. Despite the crazy premise–I mean, JAPANESE STEAMPUNK?–I never once felt like the world was imaginary. Everything felt real, from most of the characters to all of the settings. The POV switches were TOTALLY unnecessary, that is why they irk me. I don’t mind them if they have a purpose, but for me the entire book could have been told by Yukiko and nothing would really have changed. I mean, the book is third person anyways. It was further annoying that the switches could happen over a paragraph break with no warning. If you are going to switch POVs all over the place, please at least use chapter breaks. Absolutely none of the love triangles in this book were ever fleshed out. There was simply not enough time in this complicated plot. Given that they didn’t really serve a purpose either in the overarching plot, they annoyed me even more than usual. Alright, alright, I know that’s a lot of negativity right there. But remember, ALL THAT only made me dock ONE STAR from my review. That’s it. All that, just one. Trust me, there is a reason. For one, I HAVE to admire Kristoff’s prose. I’ll have to return to this when I’m in the mood to really focus on a book, because there will still be so much more new information I can read. I’ve used complex and complicated a lot in this review for a REASON. 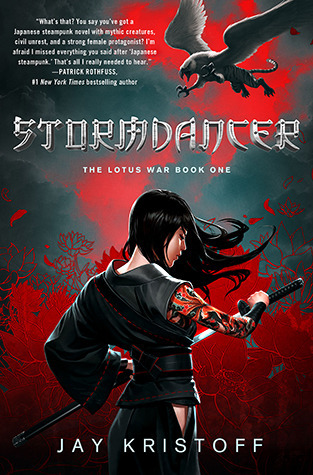 Stormdancer is, at the very least, ambitious beyond belief in terms of the world-building, the vocabulary and the plot structure. It is then even more impressive that Kristoff manages to present all of it with watertight confidence. I also really enjoyed the characters. Yukiko is my kind of girl (though I’m not sure all that swearing was necessary; I get that she’s tough). Even better, the thunder-tiger’s voice popped off the page and really grew throughout the book. He was probably my favorite character of them all. Oh dear, this review is getting way longer than I like mine to be. Oh dear. Uh. I’ll try to wrap this up quickly. Basically, here’s the deal: a lot of things that annoyed me in this book were personal preference and require the right mood from me. The important thing to remember is that even though there WERE all those things, I’m still giving this book 4 stars. It was SO GOOD it overcame all the annoying parts. It was SO GOOD that I slapped my keyboard when I realized Goodreads has neither a title nor a release date for book 2. Was it perfect? No. But it was pretty darn close. Man, I really can’t wait to read this one. It sounds so different from most of the YA books out there (I guess, aside from the love triangles). IT IS. In terms of uniqueness, I give it a billion and infinity stars. The love triangles were just … awkward and unecessary. It was one of the places it felt like the CRAZY COMPLEX plot was just too big for the book. Not gonna lie… even your “negative” thoughts about this book made me want to check it out! I like that there are imperfections in books sometimes, within reason of course. I sometimes wonder if books that get a lot of hype are really just a lot of hype, but I’ll admit this one sounds kind of amazing. Like you said, Japanese Steampunk! Crazy! Great review; glad you were honest about your thoughts on the book! Can’t wait to check it out myself! I always try to be honest to a fault. I actually cannot say nice things when I have other opinions. 😛 But still, I think this one deserves 99.9% of the hype it’s been getting. This book sounds awesome 🙂 !! I look forward to read it.. Thanks for the great review !! I’m so glad that you were honest about there being a few negatives to this book. And the fact that you only deducted one star for all that makes me want to read it even more. I have seen a lot of hype about the book, but I wasn’t sure how many grains of salt I needed to take it with!! Your review is putting this onto my wishlist!